Copytex is your ONE STOP DOCUMENT SERVICES PROVIDER since 1989. 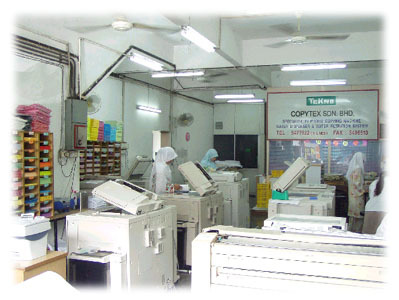 We specialize in digital laser print for black & white, full color digital copying and wide format AO size plan printing. We carry an excellent inventory of full range equipments, that allows us efficiently to print your hard copy documents or your data from diskettes, CD ROM, memory stick or data storage conversion to plain paper copy. We provide all kind of finishing services, book binding, booklet making, laminating, cutting and drilling services. We are able to offer a service tailored to meet your specific project requirements. We are currently provide FREE DELIVERY to the area that we are cover if your printed job are exceed RM300.00 in a single order. Apply now to join as a Copytex Privilege Card member to enjoy a 10% saving at all Copytex company's outlets and its Franchise outlets with subjected to the respective local outlet's terms & conditions.